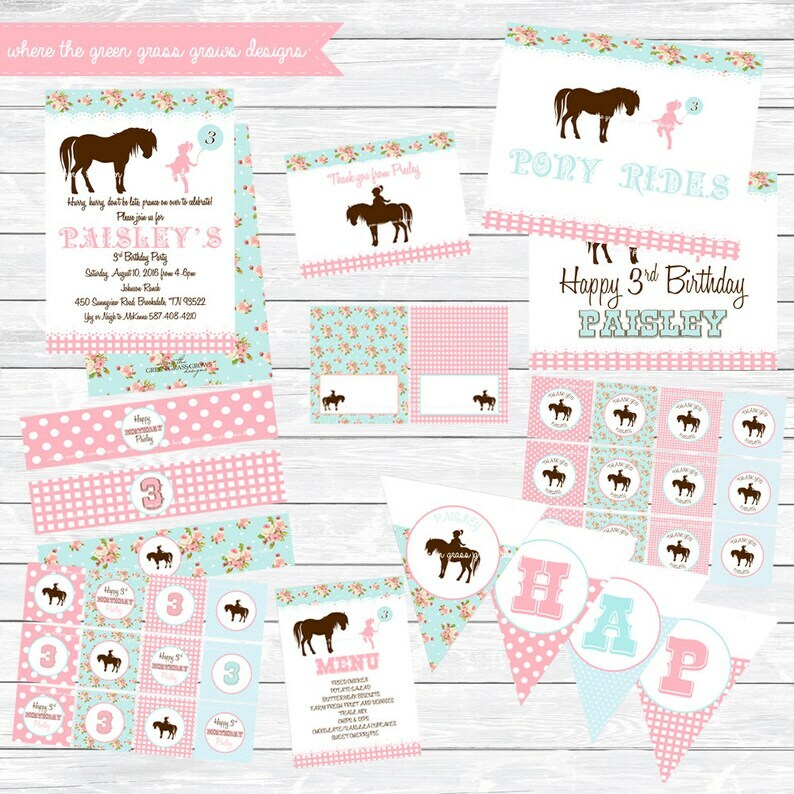 This listing is for a complete digital Shabby Chic Pony Party Package. ***Please note you WILL NOT receive any printed products with this listing, all orders will be sent via email to the email address associated with your Etsy account within 24-48 hours. You will receive your PRINTABLE files in PDF format for printing at home, emailing or uploading to a professional printer. The back file will be sent too, if you would like to print the backside floral pattern print. 12 2" circles on a sheet. Print as many as you need. Pony image with name and address. - Pony Water Bottle Labels - Sized for a standard size water bottle. 3 on a page, it's a mix of the pony image, Happy Birthday (name) text and Age in a fun vintage style font. - 8" x 10" Party Sign. Text say's: PONY RIDES under the pony and girl image with balloon. Text will list your menu items, or text section will be left blank for handwriting. - HAPPY BIRTHDAY Banner with pretty pony image on each end with child's name arching over the image. Size: 3"x5" when folded and standing. - Cupcake Toppers. 12 2" circles on a sheet. Print as many as you need. Mix of pony image, Happy Birthday (name) text, age in a pretty vintage style font. - Thank you Favor Tags. 12 2" circles on a sheet. Print as many as you need. Pretty Pony image, with thank you text and name. Additionally if you prefer a .jpg format please also note that when you send the rest of your information. Please note these designs are for PERSONAL use only and may NOT be used commercially or resold under any circumstances. All rights belong to Where the Green Grass Grows Designs. All items are also sold in a printed and shipped option. See party shop for party items that I print, assemble and ship. Please note processing times prior to purchase. Amazing design and excellent customer service. Andrea was absolutely amazing during the design process and timely responded to all requests. I highly recommend working with her. Everything was perfect! My order was finished very fast!! I made a mistake with my information for invitation and she fixed it no problem! Thanks again!